Last Friday, after the Tokyo Yakult Swallows were crowned as the best team in the Central League for 2015, Tetsuto Yamada wasn’t quite ready to weigh in on the topic of the CL’s best player. Asked about the possibility of being named this year’s CL MVP, all the 23-year-old could offer was a sheepish grin. “Um, I don’t really know about that,” Yamada stammered, until Swallows manager Mitsuru Manaka, sitting to Yamada’s left, helpfully suggested the star infielder pass on the question. “Pass,” a grinning Yamada said eventually. He was more effusive with his bat in the Swallows’ regular-season finale on Sunday, hitting his 38th home run of the season during a 10-2 loss to the Giants, in a game with zero ramifications. 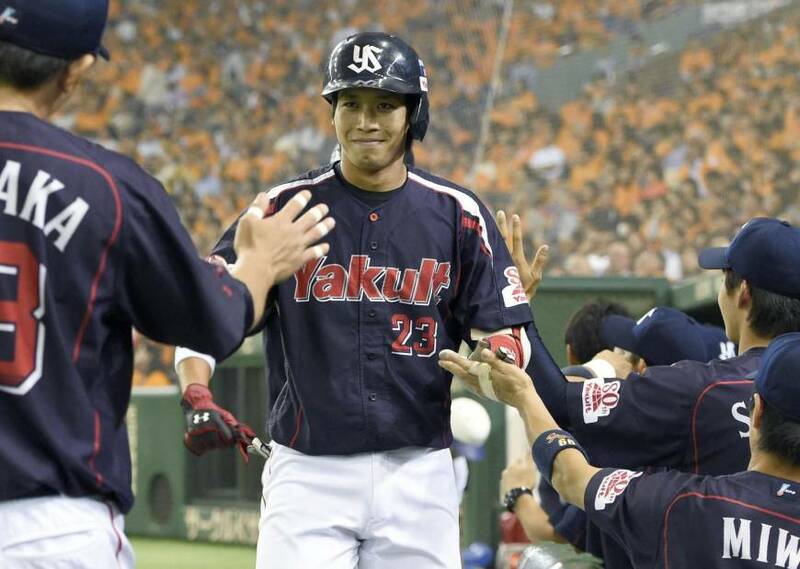 The Yakult second baseman ended his regular season as the CL’s home run leader with 38 and was second in the league in batting average and RBIs, at .329 and 100 respectively. He’s also just the ninth player in NPB history to record a “Triple 3” season, that is, ending the year with a batting average above .300 and at least 30 home runs and 30 stolen bases — Yamada swiped a league-leading 34 bags. Yamada may not have had an answer to Friday’s question, but the race for CL MVP probably ended at the same time the one for the pennant did. Yamada’s season was already deserving of the award. The Swallows’ championship is simply the icing on the cake that should sway wayward voters hung up on what the “V” in MVP really means. The definition of what constitutes value in regards to MVP awards is often a hotly debated topic in the sports world. For some, the criteria begins and ends with a player’s statistics, while others feel the performance of the player’s team as a whole must be considered. In Japan, the latter is the prevailing thought in the minds of many MVP voters, and it generally takes something out of the ordinary for a player who didn’t play for the pennant winner to take home the hardware. The CL has been giving out MVP awards since 1950, and only three times has a winner come from a team that didn’t finish in first place. In each instance, the MVP winner gave the voters a reason to think outside the box. Sadaharu Oh was honored despite playing for a third-place team in 1964, the year he set a new single-season home run mark with 55. A triple-crown year for a second-place Giants team saw him win again in 1974. The Swallows’ Wladimir Balentien broke Oh’s home run record with 60 in 2013, and that helped him take the award despite the Birds finishing last that year. Yamada would’ve probably gotten a similar bump from his Triple 3 campaign had the Swallows fallen short of the CL title. To have that type of year for the league champion probably makes him an easy choice now. 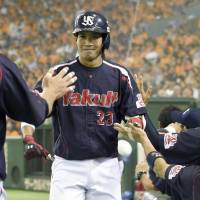 The Yakult second baseman established himself as one of the best young players in Japan last season, and his performance this year proves 2014 was no fluke. He was one of the driving forces behind Yakult’s rise this year and his play helped lead the Swallows to the top of the CL pile. Which is probably where Yamada will be sitting when it’s time to start handing out awards.